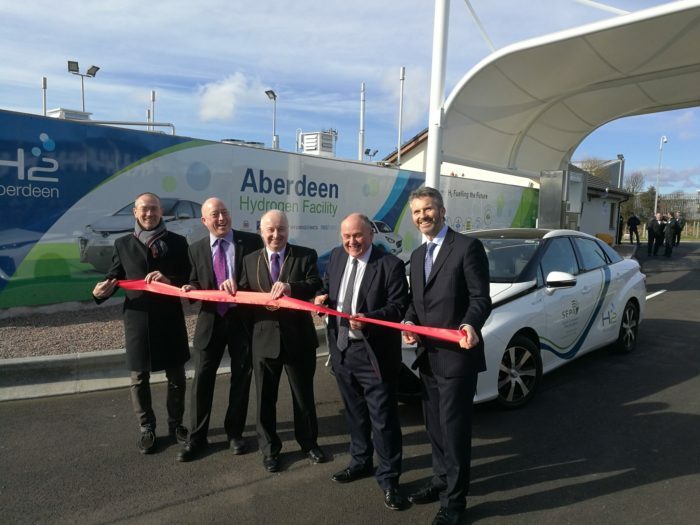 Aberdeen City in the United Kingdom received its second hydrogen (H2) refuelling station on 27th February 2017. Along with the station, an initial fleet of 10 hydrogen cars Toyota Mirai was launched to ensure first regular customers for the station. The station was funded by Aberdeen City Council, ERDF, Transport Scotland and Nestrans and it was built and will be maintained and operated by Hydrogenics. It was designed to to produce 130kg of H2 per day and to dispense it at 350 bar and 700 bar pressures. Initial fleet of 10 Toyota Mirai cars will be leased for three years. Five vehicles will serve the National Health Service (NHS), three will go to the Co-wheels car club, one to Scottish Environmental Protection Agency (SEPA) and one to Aberdeen City Council. The project is part funded by the UK Government Office for Low Emission Vehicles (OLEV) and Transport Scotland. The launch of hydrogen station coincide with an international summit on the H2 transport supply chain, which will be hosted by Aberdeen in March 15th to 17th.